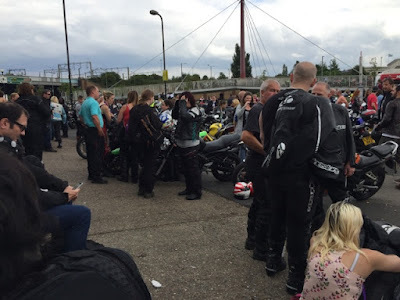 Travels With My Scooter Motorcycle: Another World Record Broken! This morning after a late night out with a friend last night, I got up at 6am, and lay in bed for about an hour asking myself, "Do you want to do this, Shazza?" 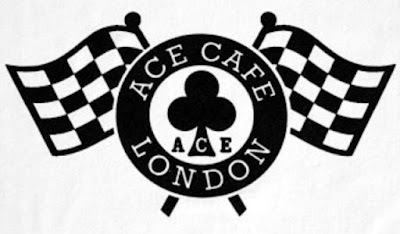 My eyes were still groggy with sleep but with the excitement of the day on my mind, I jumped up, showered, put on my full armoured gear, grabbed a fruit pack I prepared at midnight the night before, and rode the 45-minute scenic journey to The Ace Cafe. 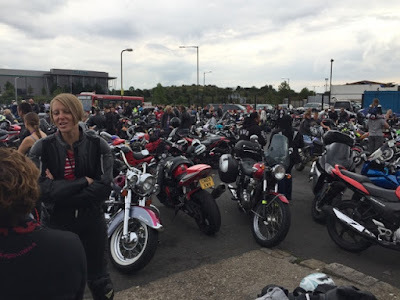 I arrived just after 8am to a handful of ladies setting up in the car park for the first World Record Attempt: World's Largest All Female Biker Meet. 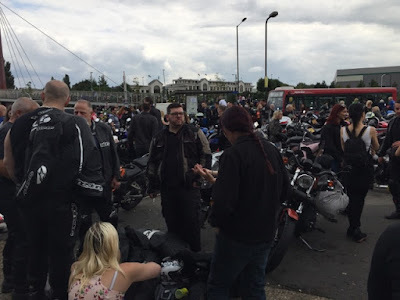 I parked up, then went over to help the organisers Sherrie and Nimi set up with the other helpers. Part of the process was an online form which served as a database for each participant's attendance, as well as, critical industry information highlighting the presence of female bikers, what we ride, how we ride, and why we ride. My job for the day was to ensure that all attendees had completed the form online or else complete a hard copy from the set I walked around with. 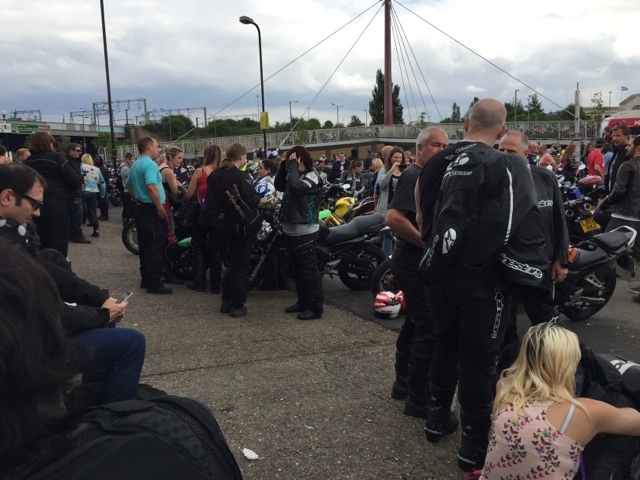 By 2pm, and well over 500 female bikers later, I had literally lost my voice. As I walked over to a bunch of ladies near the Cafe entrance struggling to say, "Hi ladies. Did you fill out the online form?" for the four hundredth time, Sherrie promptly gave me a drink voucher. So yeah, after grabbing the drink and sitting inside for a while, exhaustion set in. It was time to head home. But what an über awesome day! Love every minute of it. Read more about the day HERE. How exciting to be part of a world record attempt - I hope you broke it! So happy to hear about another broken record! Congrats. And loads of fun doing it, too, Elizabeth. Thanks! If it hadn't been for my day's program (an afternoon concert at Kings Place) I'd been there... (alas, not on a bike though). Would've been great to catch up with you there, too, Sonja. Next time, then! Im glad you did it! And now you get to share with us. What an amazing experience.